Lucas Extreme Duty Gun Oil is a special blend of oil and petroleum-extracted additives producing a lubrication specially formulated for high volume, high heat and friction firearms. Lucas Extreme Duty Gun Oil is designed for semi-auto rifles, shotguns and pistols as well as full auto firearms and suppressors. It offers superior burn-off resistance. Its polymeric film protects metal from rust, moisture and dramatically reduces wear during all shooting conditions. Applying Lucas Extreme Dity Gun Oil to bores, bolt carriers and gas pistons makes clean-up of powder residue, copper and carbon fouling a much easier task. Apply a light coat to suppressor baffles and mounts to resist carbon build up and to make cleaning quicker and easier. It neutralizes acides from fingerprints and resists drying for long term storage use. 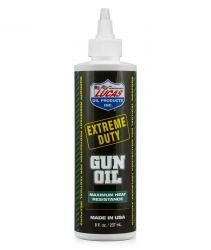 Lucas Extreme Duty Gun Oil is great for lubrication on all high heat high use firearms and NFA items. This oil is particularly suited to the demands of AR platforms and really helps keep the carbon build up on in the BCG soft and easy to clean up. The extreme duty gun oil rocks. It lasts a long time and stays in the gun. Well worth every penny, especially if you dont like to clean your guns often LOL!